Patent Application No. 62/363,172 is titled "Content Creation Using Electronic Input Device on Non-Electronic Surfaces." In brief, the patent describes the use of an Apple Pencil-like device, in conjunction with some form of motion or orientation sensor external to the stylus on any surface, like a desktop. Documentation associated with the patent is intentionally vague on how the implementation will be executed. In the patent, the stylus's movement can be tracked by "a motion and orientation sensor, a camera, or an electromagnetic- or sound-based triangulation scheme." The patent doesn't limit itself to a surface. It also notes that the data generated by the pointing device can be tracked in three dimensions, without requiring contact with a surface. Other utilizations of the technology beyond just handwriting include tracing a 3d object to make a model in the computer. Communication between the pointing device and the computer associated with the input method is not necessarily uni-directional, according to the application, possibly allowing for haptics or other information to be relayed to the user with a LED array or even a small screen. 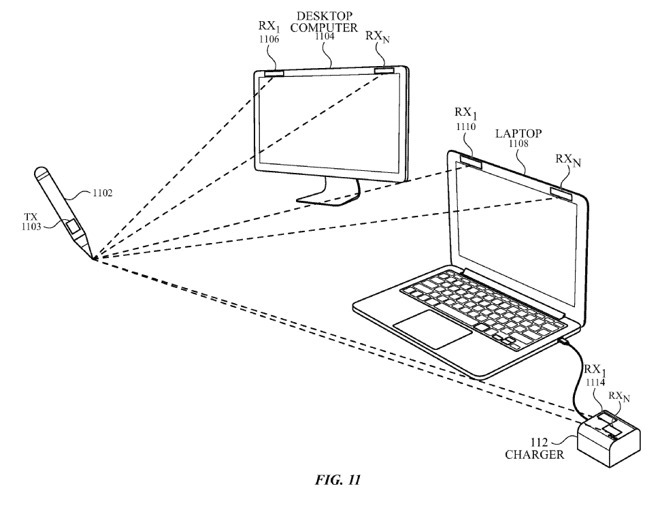 As with all of Apple's patent applications, the concept may never come to fruition. Many of Apple's patents are placeholders, or foundational, allowing Apple the legal leverage to pursue expansion of an idea or fight claims that it had stolen another company's ideas for a future product. U.S. patent application number 62/363,172 was filed on July 14, 2017, and made public on Jan. 18. It was first spotted by Techtastic on Monday morning.